The sweat is pouring and your heart is pounding. But how fast — or, how many beats per minute — should you shoot for while exercising? Amy Kleski, the Wellness Center Membership Manager at the McConnell Heart Health Center, recommends being aware of your heart rate targets, but not letting that be the only thing that determines your workout. 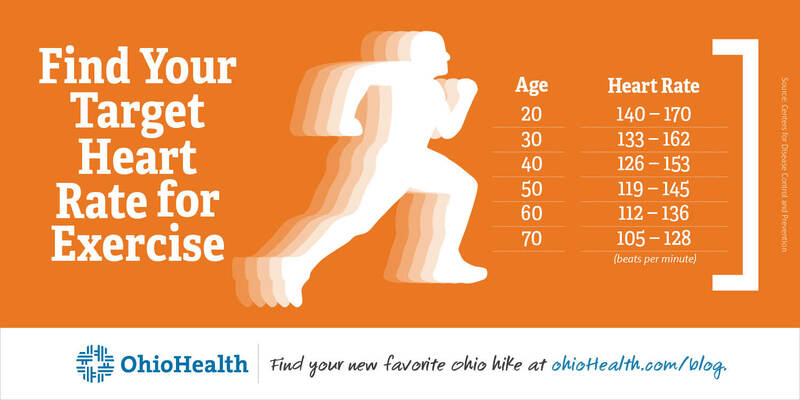 First, calculate your maximum heart rate (MHR), roughly 220 minus your age. This is the upper limit of what your heart can handle during exercise. The Centers for Disease Control and Prevention suggest exercisers aim for a target heart rate of 70 to 85 percent of your MHR. However, this is just an estimate for an average heart rate to shoot for. In fact, many people have a higher or lower MHR, sometimes by as much as 15 to 20 beats per minute. “Even if at 85% of my age predicted max heart rate, if I’m at 80% and I feel like I’m struggling, or definitely if I’m having any sort of symptoms, then that’s when you’re going to want to back off. Having the linkage between, ‘Yes, we should know where our HRs are,’ but being aware of how we feel is really the bigger thing while we’re exercising,” Kleski says. Several types of medications can lower your maximum heart rate and, therefore, lower your target heart rate zone. If you’re taking any of these medications, ask your doctor if you need to use a lower target heart rate. If you’re looking for more than an estimate, consider talking to your doctor or a personal trainer at the McConnell Heart Health Center.